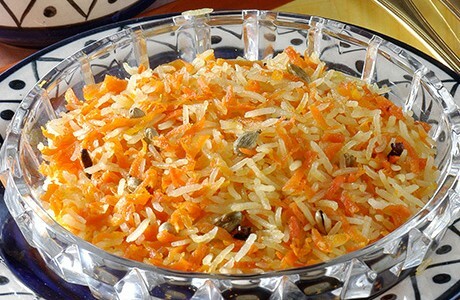 Sweet carrots are the perfect addition to light, fluffy basmati rice. This fragrant dessert is the perfect way to cool down after a hot curry. Bring 6 cups water to the boil. Add the drained rice and cook uncovered until the rice is half done. Drain the rice and keep aside. Heat the ghee in a pan; add the green cardamoms and cloves; saute until the cardamoms change colour. Add the sugar; carrots, rice, and vetiver essence; stir carefully to mix well. Reduce heat to very low. Cover and cook until the carrots are very tender and the rice is cooked, stirring occasionally.